Kashan, April 3, IRNA – Over 4,500 foreign tourists have visited the historical sites of Kashan city in Isfahan province since March 20 to April 1, local officials said on Sunday. Over 1.520 million Iranian and foreign tourists traveled to Kashan city during the mentioned period. The name of Kashan comes from Kasian ― the original inhabitants of the city, whose remains are found at Tepe Sialk (Sialk Hill) dating back 9,000 years. Between the 12th and the 14th centuries CE, Kashan was an important center for the production of high-quality potteries and tiles. Also, the word for a tile (kashi) comes from the name of the town. Tourists love this city because it has such a long history and great buildings. 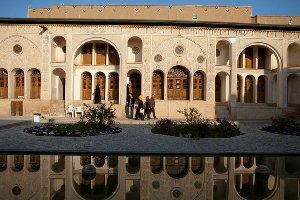 Fin Garden, , Sialk hills, Boroujerdi House, Tabatabaei House, Abasian House, Niasar, Kashan National Museum, Doll Museum, Reies Cave and Sheibani Museum are among the historical sites of Kashan. Archeological discoveries in the Sialk hills, which lie four kilometers west of Kashan, reveal that this region was one of the primary centers of civilization in prehistoric ages. Kashan dates back to Elamite era.